While a ring was cool, I figured that now that we had the framework for generating a 3d slideshow gallery, it should be pretty simple to extend this to include a bunch of different shapes: Vertical, Cylinder, Ribbon, Double Helix, Coil and, of course, Ring. I was able to create these 8 different shapes using 4 parameters. Flat controls whether each slide will be a different height or even with its neighbors. Vertical controls if the rotation is on the x-axis or y-axis. Rows creates multiple smaller circles based on the number. Helix controls how many streams there are. So the default ring woud be flat, 1 row, 1 helix and not vertical. Go over to the demo page and try out some of the different shapes with different numbers of pictures. It is interesting to see which handle many pictures really well. The Double Helix, Ring and Vertical are pretty unwieldy at around 100 pictures, but look cool with fewer. The Cylinder looks ok with less than 30 pictures, but I think it really shines with more. 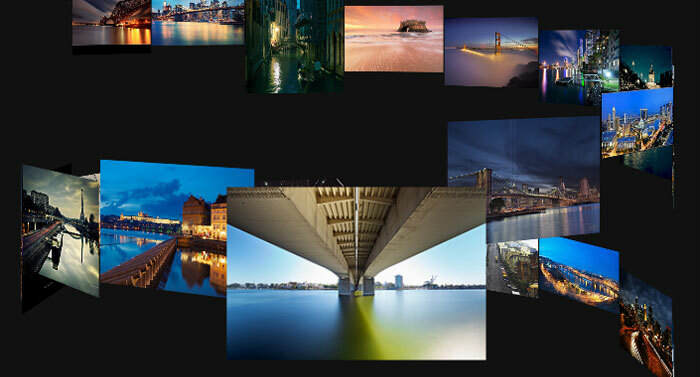 Try the Cylinder or Tall Cylinder with 120+ pictures and it looks awesome, everything is still easy to see and navigate. I like the Coil and Big Coil also, they look pretty good no matter how many pictures, but they take up a ton of room for the amount of pictures they show at one time. Ribbon isn’t all that exciting, but it looks nice enough and it doesn’t take up too much room. One nice little addition I added in was the left and right arrow keys should now function to move you through the photos as you would expect. This makes navigation a little bit easier and is also a nice way to move through some of these new shapes in a way that wasn’t really necessary with just the Ring. Make sure you take a look at the finished demo (or the original demo) and get the source on github. Which shapes do you like the best? Type in about:flags in your address bar, enable GPU Accelerated Compositing and restart your browser.